Happy November! I hereby declare this the month of Gratitude and Organization. Why, yes, I do sometimes fancy myself Oprah, why do you ask? Thanksgiving is my absolute favorite holiday. It’s all about everything I believe in: family, gratitude and comfort food. I have hosted Thanksgiving more times than I can count (and often for no less than 20 people), but this year is a rare and admittedly welcome year off for me. We will be traveling a mere five minutes away to the home of one of my favorite hostesses, so I know Thanksgiving will be in good hands. It also means my family will be spared my Annual Thanksgiving Mental Breakdown, which usually ends with me crying, “Never again!” or “WHY do I do this to myself?” or “WHEN will I learn?” But in the end, it’s like childbirth: difficult but exhilarating, and always, always, always worth it. I will be sharing some of my favorite Thanksgiving recipes with you this month, most of which come from the mack daddy of all Thanksgiving cooking magazine issues, the much-lauded November 1999 Bon Appétit. And I’m sure I will be trying some new stuff as well, because I can never resist an appealing Thanksgiving recipe. Send me your favorites! In addition to recipes, I will also be sharing my journey of household organization, starting with my kitchen utensil drawers. 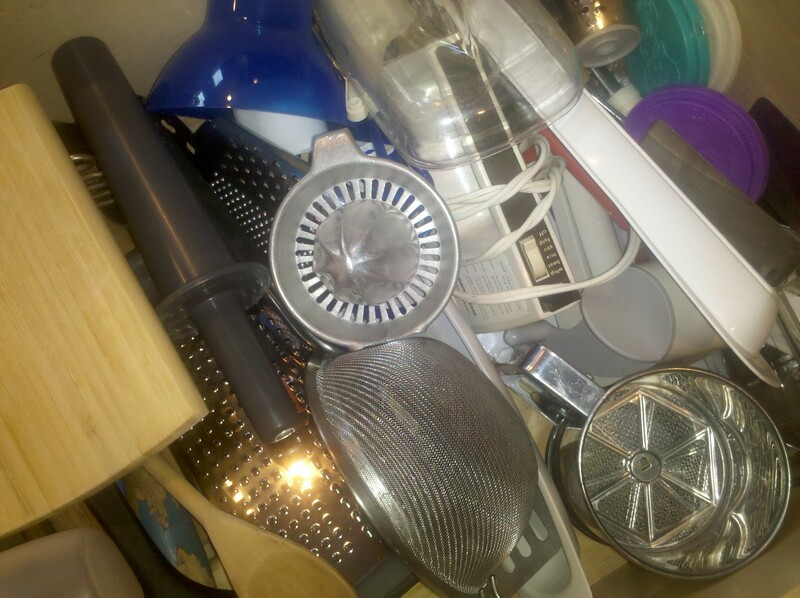 I would love to hear if any readers have utensil drawer organizational solutions. I have two deep drawers and lots of utensils, so my first step will be throwing out or donating anything that hasn’t been used in the last two years. I will leave you with pictures of my two unorganized drawers, pictures which may evoke words like hoarder or mental illness, but rest assured, I am working on this today. p.s. Note the three cat food lids. Our cat died in 2005. RIP Lulu. This entry was posted in Life and tagged gratitude, kitchen drawers, November, organization, Thanksgiving by Mom Mom's Apron. Bookmark the permalink. Glad to see I am not the only one with a tendency to overbuy kitchen items. I have baskets in my deep drawers that help organize by types of items. But in the end they are still a mess. Dawn. Cookie cutters should not reside with wooden spoons. I should get in the car and intervene, if only these people I live with wouldn’t object. The best part, dear Patty, is that I don’t even LIKE sugar cookies and last made them in the preschool years! Are you opposed to crocks? 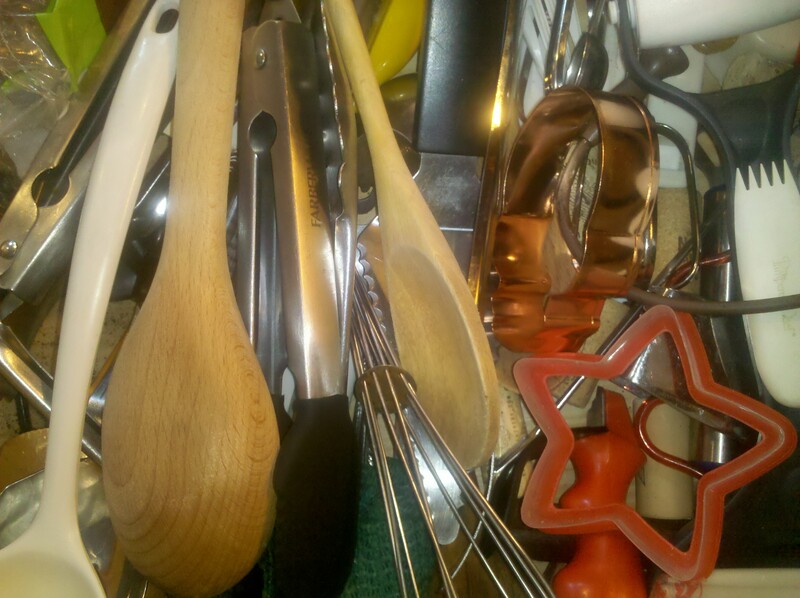 I have three that sit on my counter and hold my wooden spoons, spatulas, wire whisks, tongs, scissors…. Also, I keep the Vita-Mix plunger with the Vita-Mix. And, I agree with Patty on the cookie cutters. I have a special tub in the pantry that has the cookie cutters and other decorating items (like pastry bags and tips). I keep baking stuff separate, and what’s that big bamboo board type thing in the upper picture? I’m pretty sure it needs to go somewhere else. Dang, I wish I had known about those cat food lids, before I went out and bought one last week. You know I totally would have sent you three cat food lids if I didn’t throw them out! Okay, I will give you the Vita-Mix plunger and the cookie cutters, but I am keeping my SMALL bamboo cutting board in there. I used to have it up high with all my other cutting boards, but one time when my mom was visiting she moved the small board into the drawer, and it’s just so handy to have something quick to grab for a quick/small chopping job that I decided to keep it there.